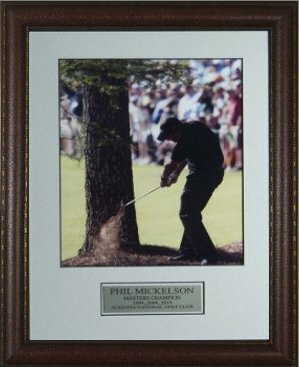 This is a Phil Mickelson 2010 Masters Champion "Shot of His Life" Custom Deluxe Leather Framed 11x14 Photo Display. Featuring an original photograph of Mickelson hitting from the pinestraw to hole #13 at Augusta National. The signature moment came on the par-5 13th, with a 2-shot lead, he was stuck between two Georgia pines and had just over 200 yards to the pin, with Rae's Creek guarding the hole, he swung the shot of his career dropping the ball three feet from the cup. It has been called the "Shot of his Life" and very well could have been the shot that won him his 3rd green jacket.